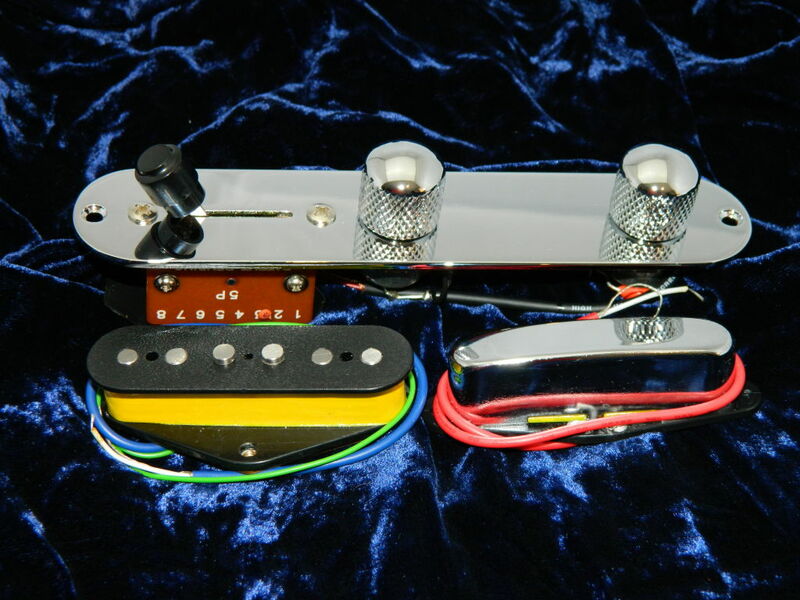 Complimenting the Ironstone Telecaster pickups, this Telecaster 5 Way Control Plate set consists of a hand built, custom wired control plate and a pair of specially matched Tele pickups to give a complete Telecaster multi-tone solution that can be dropped into your guitar with minimal effort. 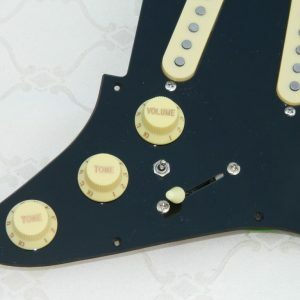 The control plate uses high quality components, and features a Strat style 5 way lever switch to expand the normal Telecaster tones, along with Treble Bleed and Gibson ‘Vintage 50’s’ tone control mods. 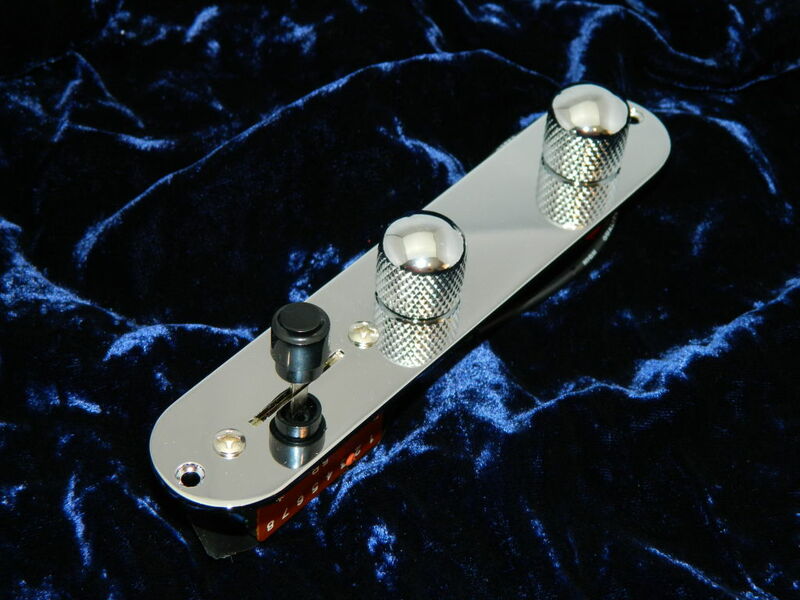 There are plenty of good designs around for multi-tone Telecaster pickup switching, but the Ironstone Telecaster 5 Way Control Plate design avoids expensive and complex ‘super’ switches, and focuses instead on simplicity and maximum tonal value for money. Only available through this website, this hand-built set is assembled in small batches, so please allow up to one working week from purchase to despatch.. 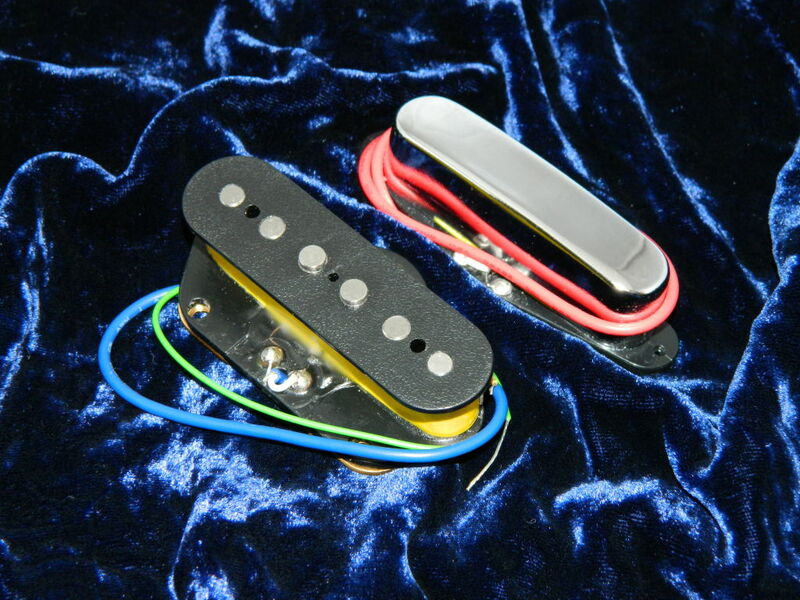 Position 1 delivers both pickups in series for a fuller ‘fat’ tone and increased output, reminiscent of a humbucker. Position 3 uses passive filtering to generate a classic ‘out of phase’ effect, the ‘thin’ and reduced volume tone. 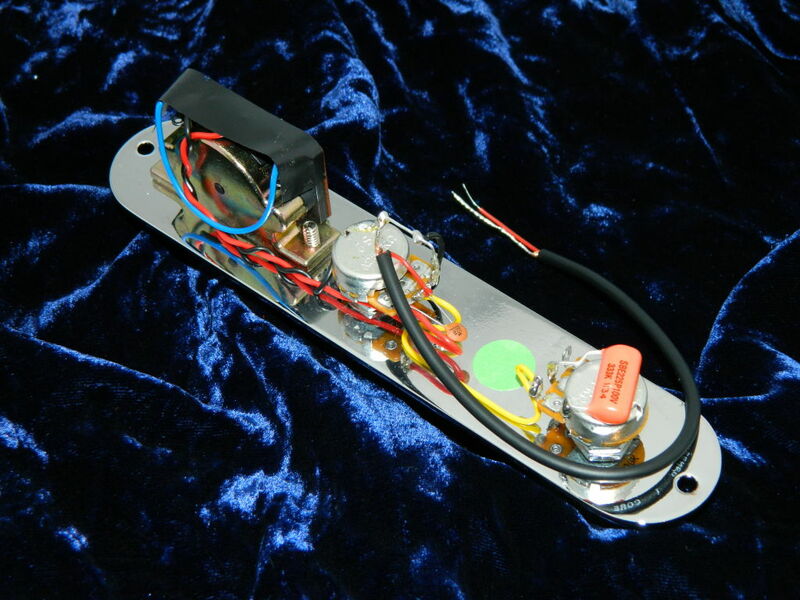 Additionally, the Telecaster 5 way control plate features a tone control wired as the famous Gibson Vintage or 50’s configuration, renowned for its smoother control and perceived fatter, more transparent tones (check out this web link) .The volume pot is also fitted with a 1nF treble bleed capacitor, that not only preserves the treble as the volume is rolled off, but can give a range of new tonal possibilities as it allows bass to be rolled away while treble is left relatively constant in the mix – the opposite of a normal tone control. A minimum body cut-out depth of 30mm is required to mount the control plate. Special thanks to Alan Reigh for the following videos of his immaculate Tele build featuring the Ironstone 5 way pickup and control plate set. Sound clips to follow! The clean files were all recorded using a Mesa Boogie DC-2 Studio Caliber, mic’d up with a Shure Beta 57 into Logic Pro X. The dirty clips were recorded direct into Logic Pro X using the Scuffham S-gear plugin. My mate from Wales kept suggesting that I should get a Telecaster for some time and that’s what I did; I’ve bought a great Tele style guitar that is just a fantastic playable axe, BUT the stock pickups were sounding very muffled and thin. I might be new to teles but I know what Tone I need and since my Strat already has the amazing Ironstone Silvers in it with a 7-way switching I knew where to go to pimp my Telecaster! Off to Tony’s! 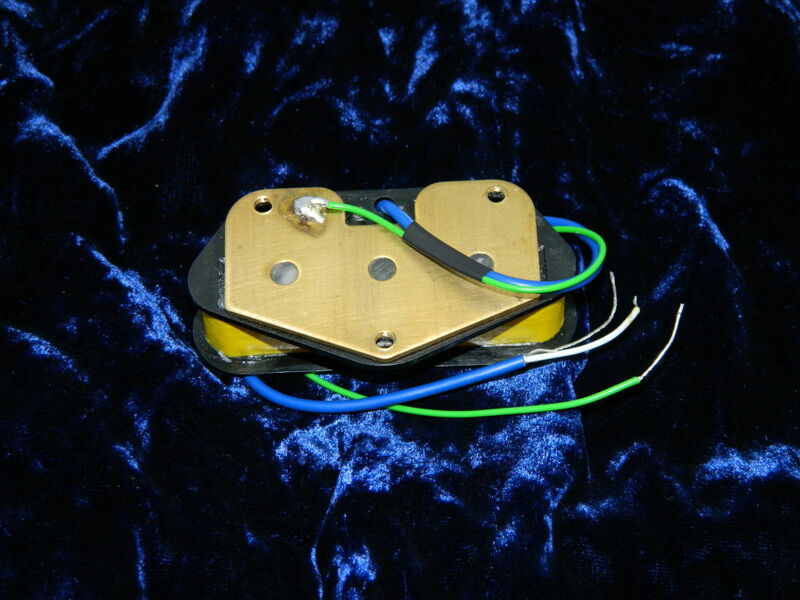 I ordered this 5 way Tele harness set with his pair of Tele pickups. Got it in no time from UK to Denmark!! Fast shipping and well packaged! Tony was also helpful via email as I had some extra questions regarding the harness. After I loaded my tele with this set/harness, I gave the Tele a spin but could not find the tones I was looking for. Wrote to Tony again and he suggested focusing on pickup heights. I did that and after some fine tuning the heights I have found My Tone! The treble bleed is not my tone so I took it out (personal taste). I also dislike 50’s wiring so re-wired it to normal Tele wiring (personal taste and easy to do). This guitar is now my go to! 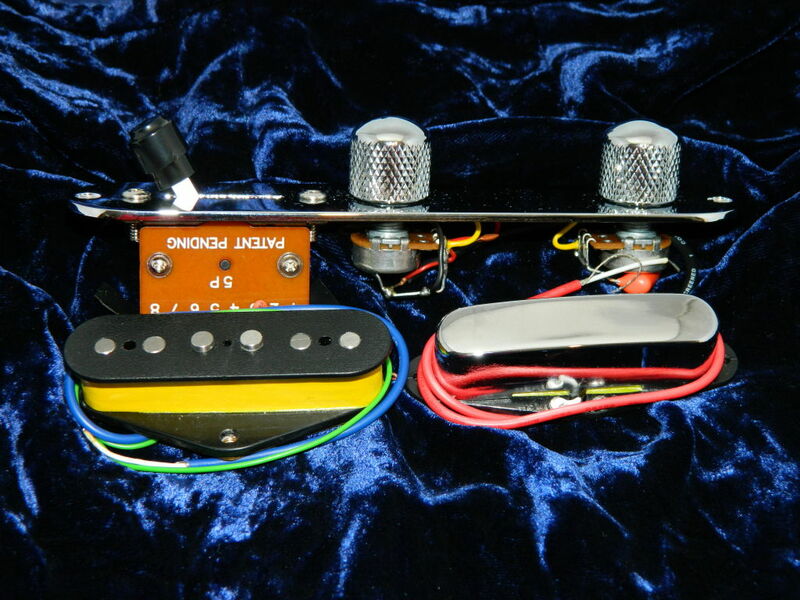 It covers all from twangy tele tones to shwangy fat humbucker like tones on the Neck-Bridge is Series! The N+B in Parallel is just so musical, love it with chords/arpeggios! 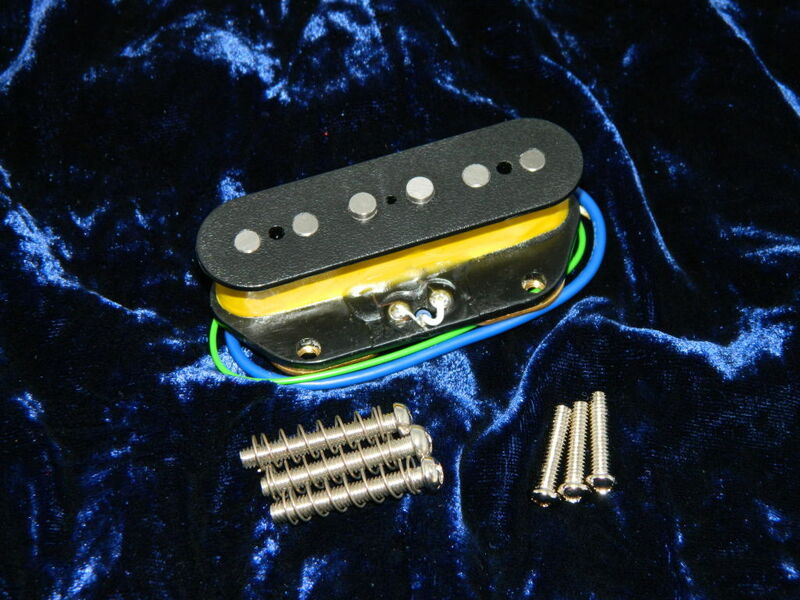 What surprised me positively is the bridge pickup which normally should be very sharp and trebly and in my book something I never use, but in this case, the Ironstone Te bridge is very warm yet cuts through anything in the mix! Thanks for all of the comments and compliments. No immediate plans for P90’s or single coil size humbuckers at present though. 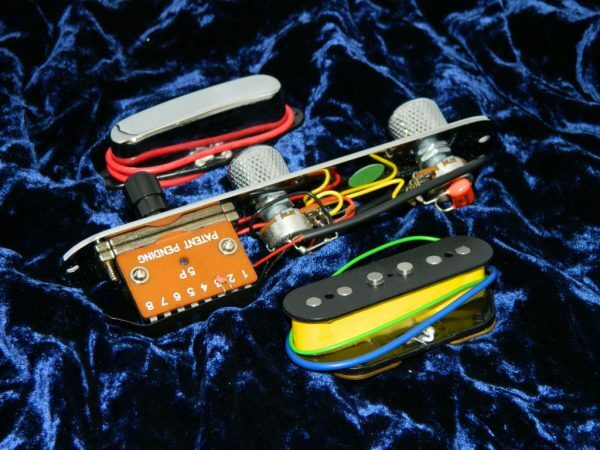 I installed these in my squier Tele as the stock ones were lifeless. The punch, and unmistakable Tele tones you get with these are incredible for the price. You can adjust volume, and tone for an added variety of sounds on top of what you already have. I was unsure how to wire them to begin with, but Tony was more than happy to point me in the right direction, and was simple in the end. I’m looking into upgrading another guitar with humbuckers next, and will go with Ironstone again. 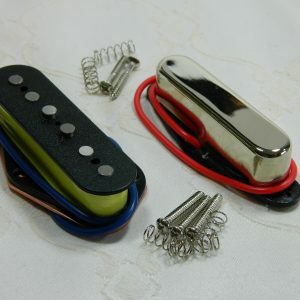 Upgrading pickups can be a bit daunting first time round, but a decent new set can give a stunning transformation, and Ironstone is always willing to give advise (together with a mass of free online technical support articles and diagrams). Ok bit of context first, I’m a middle aged, advanced beginner/beginner intermediate player and as well as spending as much time as I can spare practicing I’m also interested in buying cheaper, second hand guitars and doing a bit of modding. This was my first go at replacing the electronics in a cheap, secondhand homemade tele and the results have been incredible! 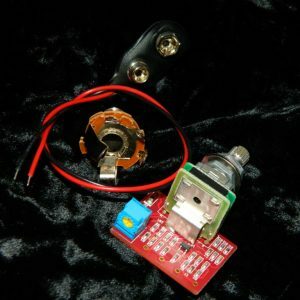 The set is beautifully made with quality parts, not the thin, possibly single stranded wire and weedy switches/pots that seem to come as standard in low end guitars. Once plugged into my amp the first thing I discovered is the sheer presence of the sound. Not just volume (although I think I could join Spinal Tap now on that score alone) but the clarity of the notes without any break up or unwanted distortion (this was through my clean channel). The range of tones is also impressive and something I need more time to fully explore but the 5 way switch is a huge advantage over the standard 3 way. So all in all I feel that I now have a great sounding guitar for under £200 in total and I’ve learnt that this is definately the way to go for those on a budget who want to sound like they’re not! The customer service was also second to none, so I’ll certainly be back next time I find a bargain used guitar that needs some help being heard! Glad to hear you are so impressed with the tone of this set. And yes, careful quality component selection is at the heart of Ironstone’s way of doing things. Enjoy! 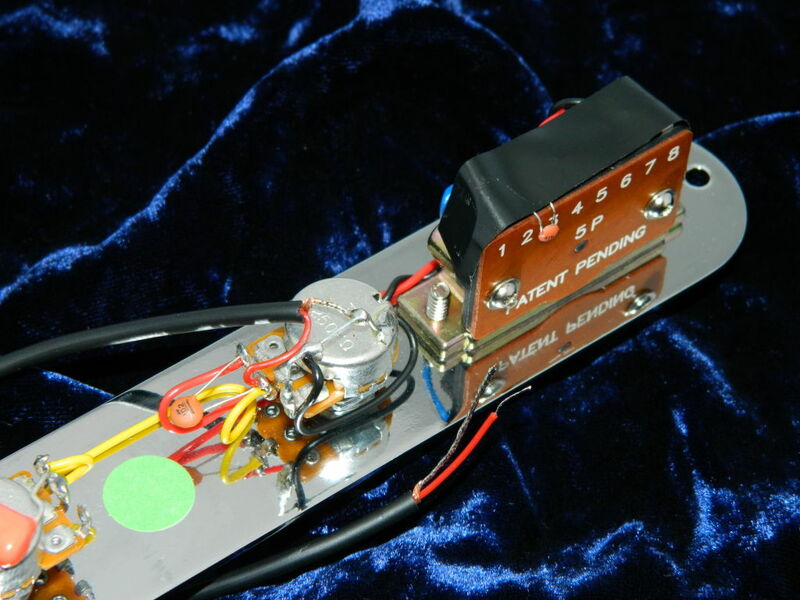 I bought the control plate and pickups to try to add a some life into an otherwise dull and muddy sounding cheap telecaster copy, you may ask why bother but the actual guitar itself is rather nice. Well fitting the parts was really easy, the instructions are great, the look and feel of the parts is also really good. As to the sound, well the range of tones available is really very impressive and have really brought some vibrancy the guitar, with a good balance of bass through to treble, I’m delighted with results. in fact my mate will soon be contacting you about a set for his Tele. I bought a £70 guitar from ebay as a project and put these pickups in plus the controls and in my opinion, it sounds better than any guitar costing 5 times that. “I thought I’d update you after some playing around this weekend. My initial thoughts are still there – this is an incredibly versatile setup. well, and despite my reservations about my soldering skills I managed the 7 joints easily enough (5 on the switch and two on the jack). amount of sustain available, the Gotoh bridge will help but those Alnico V magnets add something of their own to the mix. Position 1 (bridge and neck in series) gives an amazingly full sound, something not too far away from a humbucker. Position 2 (just the bridge) gives more of a twang, but it’s a lot fuller and warmer than the Squier. I can see me spending a lot of time on this setting! Position 3 (pseudo bridge out of phase) is still surprisingly rich, it’s definitely a thinner tone, but has a bit of bite. Position 4 (bridge and neck in parallel) seems more harmonically rich than the normal middle setting. Position 5 (neck only) has much more depth than the Squier, but without some of the bridge pickups warmth. The tone control is a significant improvement on the standard setup. Why aren’t they all made this way? could be bettered without spending twice as much. 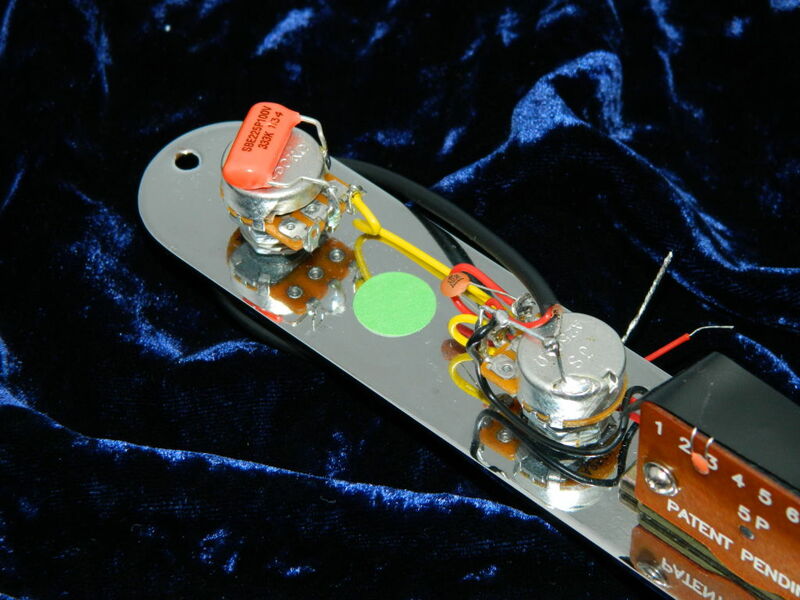 Ironstone suggested how to use the treble bleed on the volume as yet another tone dimension. Select position 1 for example for the big fat tone , then back off the volume a quarter turn. Suddenly with the bass / mid volume cut but the treble coming through you have a sort of treble boosted version of the original!